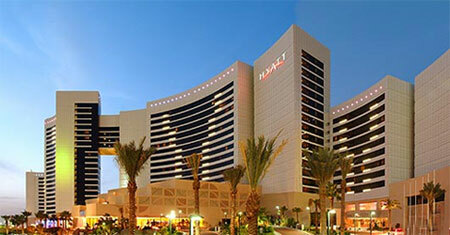 Bur Dubai Hotels - Grand Hyatt Hotel Dubai United Arab Emirates with huge discount on published rates guaranteed! Grand Hyatt Dubai offers a first for a Dubai hotel - the concept of a city resort, which includes first-class recreational facilities such as a Zen-inspired Grand Spa, a tennis centre, indoor and outdoor swimming pools and a kids’ club. The hotel is centrally located, close to Dubai city centre, the shopping and business districts, and just minutes from Dubai International Airport. Within the hotel, 14 restaurants, bars and cafes offer an array of cuisines as diverse as it is authentic from Lebanese, Italian, Singaporean, Vietnamese, Japanese or American Grill, with most of the hotel restaurants featuring open kitchens and al fresco dining terraces. Two bars and MIX, Dubai’s only super club, further complement the entertainment options at Grand Hyatt Dubai.